Images courtesy of Ballycotton Coxswain Eolan Walsh. 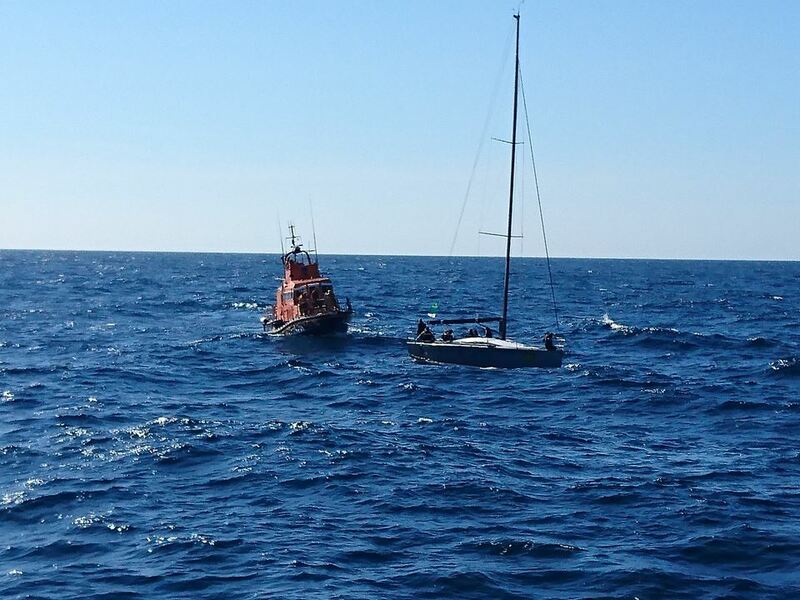 The St Mary's Lifeboat was called to assist a 39 foot Fastnet Yacht with rudder failure and 10 people onboard, 71nm NW Off Scilly yesterday. HMCG also launched the Ballycotton ALB from County Cork in Ireland to attend the yacht which was towed in to the islands and moored in Tresco channel in the early hours of this morning. The shout took place on the 9th and 10th of August 2017, lasted 16 hours in total and was the St Mary's RNLI Lifeboat Station's 12a (13th) shout for 2017. You can read the full report on the shout from the St Mary's RNLI Lifeboat Station below. The crew were paged at 1141 on Tuesday 9th to go to the assistance of a 39 foot Fastnet Yacht with 10 persons on which had suffered rudder failure. The position given was 77nm NW of the islands. HMCG also requested the launch of Ballycotton ALB as they would have a better run downwind to the position as conditions on scene reported by the yacht were moderate to rough seas and force 6 winds. St Marys lifeboat arrived on scene at 1550 (first of the 2 lifeboats ) in a position 71nm NW as the yacht had made 6 nm under a jury rudder. After passing some long heavy lines and fenders for the yacht to stream behind a tow was connected and course set for St Marys. Almost as soon as the tow commenced the yacht started yawing violently side to side due to the shape of the hull and keel and lack of rudder to hold it all in line. More lines were streamed from the yacht and the tow started again.although still yawing slow progress was made SE. On arrival of the Ballycotton Trent they were able to pass a drogue to the yacht and this was also streamed behind. This helped loads and the tow settled to a good speed of 7 knots with only minor movement from the yacht. Discussions were had over the Sat phone about the best place to moor the yacht once home.The moorings in Tresco Channel we deemed the best due to the deep draft of the yacht. She was safely moored at Tresco at 0230 (wed) and the lifeboat then returned via the of Bryher to refuel and finish the service. The crew stepped ashore at 0430, 16 hours after launching. Crew: Pete Hicks , Chris Jenkins , Kevin Sherris , Dan May , Paul Smith , Dan Moulson , Truan Hicks. Harbour Master Dale Clark told us a bit more about the rescue during this week's Harbour Report - listen below.